Triathlon athletes are no doubt one of the most versatile and toughest athletes out there. Combining three totally different sports into one good race, is an art within itself. However, it comes as no surprise that with the increasing popularity of the triathlon sport, there is a lot of misquided advice and misconceptions about how to properly train for swimming, cycling and running. There are countless, so called professional triathlon coaches which pray on the unexperienced public who of course will take any advice that gives them at least some superficial guidance into where to start their triathlon training. The public is not to blame, they don't know any different, but the triathlon coach who gives advice about what he/she does not know much about should re-evaluate their education priorities and use some sport specific resources to eliminate the knowledge gap. The problematic area in training for triathlon is the fact that all the three sports are different, so naturally they also require different approach to training. Many triathletes or so called professional triathlon coaches are usually experts in one of the three sports and just apply the same training regimes to the other two. This unfortunately does not work very well, especially with cyclists or runners trying to improve in their swimming (which is the most frequented case). True, swimming in a local level triathlon races is usually not the game changer if you can swim a little and are an expert in cycling or running, but it will give you an energetic advantage if you know how to swim efficiently. Swimming is unique in the sense that the triathlete has to move through water and not air. Since water is denser than air it is extremely important that the swimmer's body produces very little drag. Just understanding this fundamental difference is the first step to faster and more efficient swimming. Thus every triathlete should first focus on improving his/hers overall body position while swimming and not on how powerful he/she is in the water. Believe it or not, the better the positioning and balance of the swimmer in the water, the more power one can actually generate at a later time. It is easy to recognize triathletes amongst all the other swimmers in the pool. They spend most of their time swimming with hand paddles and pullbuoys trying to increase the power output of their arms, so they can swim faster in their triathlon races. I call them the paddle nazis. :). On a first thought, this is a quite logical behavior since arms are used more in swimming than in running or cycling. However, overusage of hand paddles is detrimental to a swimming stroke if there are flaws in the stroke to begin with (and there always are). It is so painful to watch this misconcepted behavior being repeated over and over in the triathlete community. Please, stop it! If I were to give just one advice to a triathlete who is trying to improve the swimming leg of the race, it would be: "Drop the hand paddles and pullbuoys and start incorporating proper swimming drills into your workouts instead." 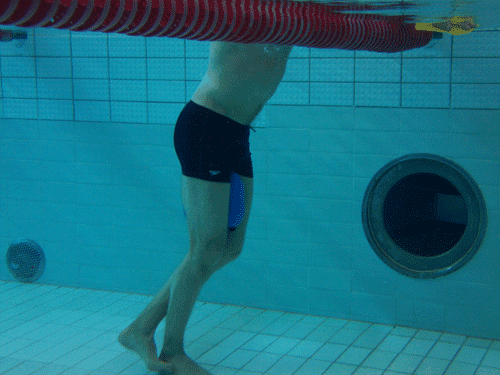 Just this minor shift in swim training attitude could produce huge results and would also eliminate the unnecessary shoulder pains and save you some money on swimming gear. If you are one of the guilty paddle nazis, try to go back and remember the first time you started using the paddles. What was the reason? Are you just using the paddles because you saw other people using them or were you told it will improve your swimming? Whatever the reason is, I guarentee you that you do not need them until you are an experienced advanced swimmer and you definitely do not need to swim with them majority of your swimming practice. If you still feel like you do need to use some hand paddles, I'd suggest trying out the antipaddles to incrase your feeling for water. By having a better feel for water you will in turn swim more efficiently. Hopefully, I convinced you that swimming needs a different approach to training than running and cycling. Just remember, the more relaxed and balanced you feel in the water, the faster you will swim. As a side not, there are more exercises you can do with paddles than what they were originally made for, check out the 8 ways to use hand paddles post to learn more.